I found a few bugs. They relate to the animation parameters. There is no possibility to put down the keys normally, I put the key in one frame, move to another frame to put the key and the timeline jumps to the beginning of the animation. I have to put the keys in the graph editor. but in this case, the parameter animation does not occur, only the first value is initialized. There is no possibility to put down the keys normally, I put the key in one frame, move to another frame to put the key and the timeline jumps to the beginning of the animation. Whenever you change a parameter, the simulation detects this and does a reset, hence the moving back to frame 1. 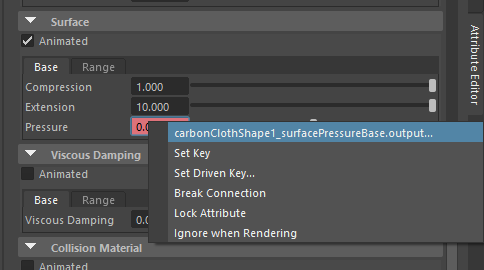 We recommend disabling the simulation using the Deactivate button on the Carbon Simulation node whilst keying and then re-activating the simulation afterwards to avoid this. I have to put the keys in the graph editor. but in this case, the parameter animation does not occur, only the first value is initialized. I am struggling to recreate this behavior. Do you have the Animated flag ticked on for the parameter section you are animating? I had a closer look and you are right, there is a bug in the frame reset. We will try to sort this out for the next release. As a work-around, if you just set keyframes but do not modify the values, it does not seem to reset for me. Then, if you right-click on an animatable parameter, and select the *.output option (see screenshot attached), it opens a table where you can edit the values. I am aware, this is not optimal, but might be sufficient in the meantime?